I have had the privilege of participating in the 8th, 10th and 11th International Sindhi Sammelans in 2001, 2003 and 2004 at LA, Vegas and London respectively hosted by the Alliance of Sindhi Associations of Americas Inc. Last year for the first time the Sammelan was held outside the United States of America and was hosted by the Sindhi Association of UK in London. This year, for the first time the 12th International Sindh Sammelan will be held in India on the 28th, 29th and 30th December 2005 at the MMRDA Grounds, Mumbai. Preparations are in full flow and no effort is being spared by the hosts – SAHYOG FOUNDATION and SINDHISHAAN to ensure a grand success. However I’m till date unable to succinctly define the objectives of these Sammelans and achievement or progress made in attaining the objectives, over the last so many years. The concept of the Alliance cannot be flawed – that of uniting, reassuring and giving comfort to the Sindhi diaspora in the United States of America. But the nomenclature ‘International’ should by its very definition encompass issues not limited to within the boundaries of US. Obviously a beginning has been made last year which is laudable. Now coming to the issues on the Sammelan agendas – these to me seem hazy and not specifically defined. If the objective is networking, getting together and reassuring each other of the existence of Sindhyat, matrimonial alliances etc. – fair enough. But to my mind it is now time to address more serious issues that haunt the community every now and then and find a permanent solution to further and sustain the community’s interests by adopting relevant programmes. What needs to be done? 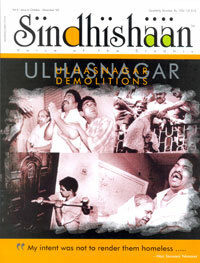 Demolitions of structures in Ulhasnagar have commenced. Sindhishaan reported on this burning issue in its previous edition. Unfortunately – there was minimal follow up – from any quarter! This should never happen again is my plea. I once again invite the readers to communicate their suggestions and share their views on the significance of Sammelans. So that the same would be taken up for discussions and implementation at the forthcoming meet. Better still – why not attend the Sammelan as a delegate and actively participate with your views.